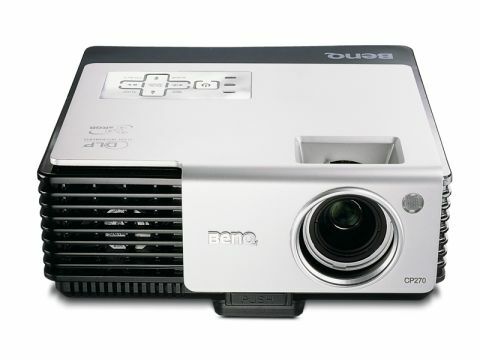 The BenQ CP270 data projector has a neat and compact design. The basic shape is square, with the lens hidden away inside the main body of the unit. Also neatly protected by the main body are the zoom and focus rings. While this makes the device a little harder to set up, it means that it's less prone to damage when carrying around. The touch-sensitive controls on the top of the unit are similar to those on the LG HS102 projector, with ten buttons featuring everything from Menu and Sourcing through to the ability to blank the screen – a nice touch when sharing the projector between users during presentations. With an overall weight of 1.5kg, this is a truly portable device, given that it has 2000 ANSI lumens rating that will project bright and sharp images in all but the brightest of meeting rooms. Connectivity on the back of the unit is rather basic given the size of the projector, and is certainly less impressive than the array found on the Optoma EP1691. You'll find a standard D-sub port, along with Video and S-Video. However, to keep the price and size of this unit to a minimum you won't find audio options included. When it comes to using this projector out and about, we found it a portable unit to travel with and, thanks to the HD Ready format, you'll be able to watch videos in widescreen format. However, the CP270 has one of the poorer contrast ratio ratings, which came to the fore when running video through this projector. While the main image showed few signs of pixellation, colour balance was less impressive than with the Optoma and Epson units. This would suggest the BenQ CP270 is better suited to office rather than home use. What's more, we found this a rather loud machine to run. The CP270 is a decent data projector that offers a reasonable feature set for the price. While it's not the most powerful or portable model, we feel it offers good value for money.